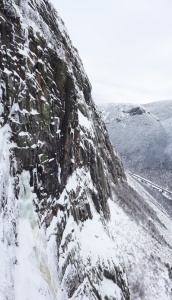 I had never been to St. Alban, a dedicated dry tooling crag near Quebec City. 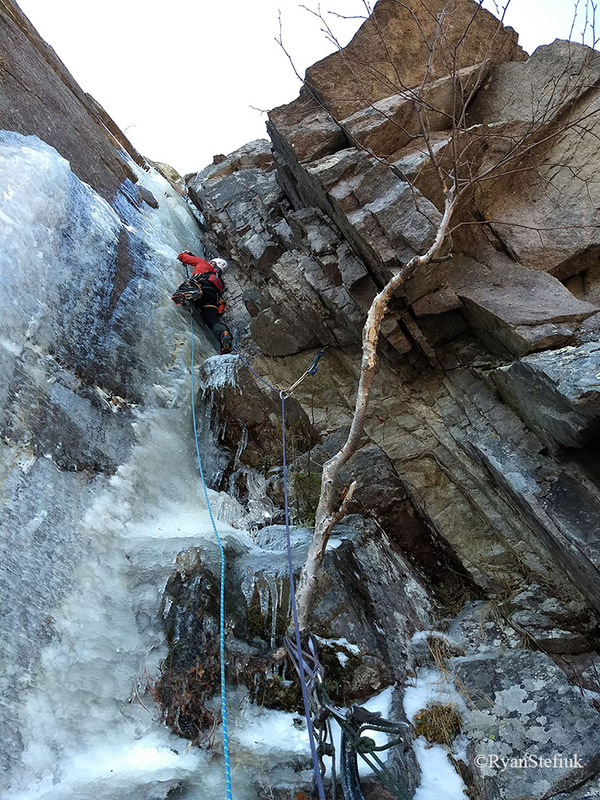 My friend Marty Theriault, who lives only 10 minutes from the crag, had several times extended an invitation to sample the chossy riverside cliffs. Marty was about to be deployed so we had to make the trip happen soon. – Zac St. Jules. Bayard Russell on attempt one, about to launch into “the thin bit”. Watching Bayard mix climb is always entertaining. The guy’s so strong when he’s rock climbing, he makes massive, dynamic leaps of faith from hold to hold, bouncing upwards with glee on teeny edges until he finishes the climb or falls off, unhampered by any type of discernible fear. In the wintertime, it’s pretty much the same. Bayard completely trusts those dicey placements most folks cringe while pulling on, swinging from ice tool to ice tool like a prizefighter dancing around a ring before a match. 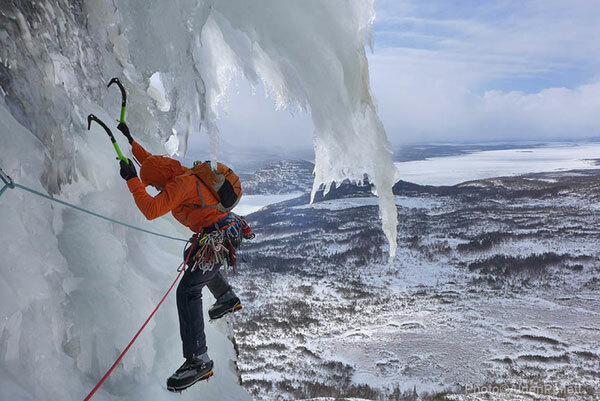 Half the time, he waltzes up something incredible, but half the time a hold breaks or a crampon skitters off and he’s flying through the winter air on a set of well-traveled double ropes. 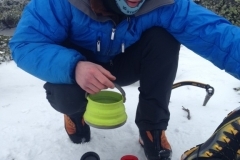 His confidence in gear and his own ability lets him surmount the head games most of us seem to wrangle with in winter mixed climbing. So that’s one part of the Bayard show. 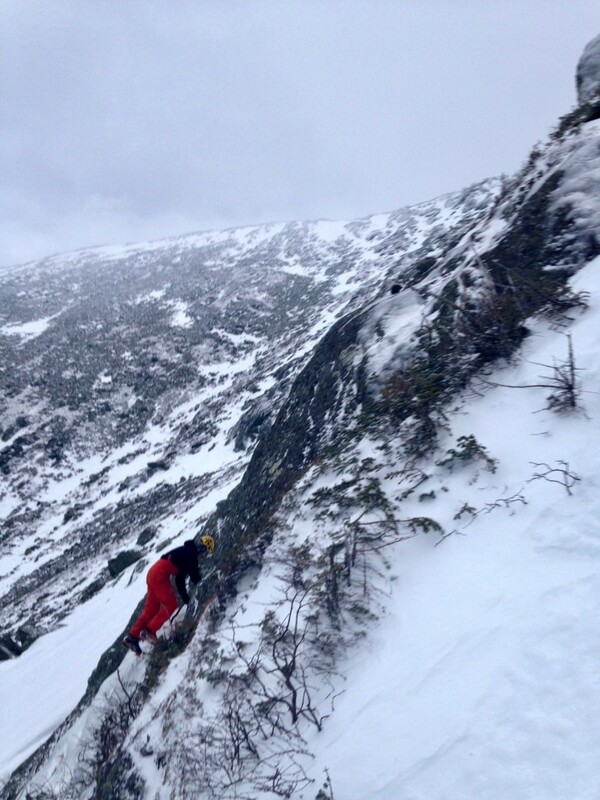 “I don’t like being told what to do,” Bayard said to me the first time we ever went climbing, as he was driving the wrong way down a one-way driveway in North Conway. And because Bayard is my boss in the summer renovating houses, and in the winter for Cathedral Mountain Guides, (and because he could pick me up and throw me into a snowbank if he wanted to) I don’t think I’ve ever told him what to do. So usually, when he neglects the tagline or half the rack and I or another of our partners ends up tossing him the pitons or the number three or the second rope, we just let him do his thing. 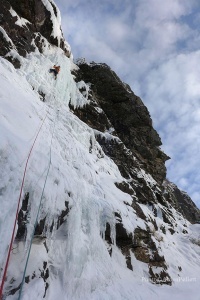 After all, he’s better than us, and even if he wasn’t, it turns ice climbing into a fascinating sport of coordination, which I suspect he’s after anyways. I guess you can only climb so much M8 trad before you need to make it more interesting. Repeating a Bayard route still garners the young guns press in New England, though Bayard himself doesn’t have much interest in posting about the climbing he’s doing. Too much time away from hanging out with his wife Anne, or sci fi shows on Netflix, or climbing. When you get older, you get busy. Who’s next? I guessed I was, and racked up, scared shitless. I scratched my way up to Bayard’s high point, banged in another piece of gear, and found the hook Bayard had popped off of…. The past four years or so, things have gotten in the way of winter climbing. I wish I’d realized how rare it was to have a week, or a day, or a half-day off in the wintertime. 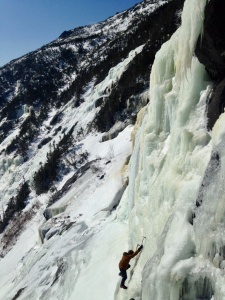 My count of personal ice climbing days has dropped into the single-digits in the past two years. As Alexa and I struggle with career changes and hectic schedules, we have to put prospective winter climbing on our calendars. I can’t drop everything when something cool comes in anymore, and it’s frustrating to watch friends with more flexible schedules tramping around the routes I’ve always wanted to do. 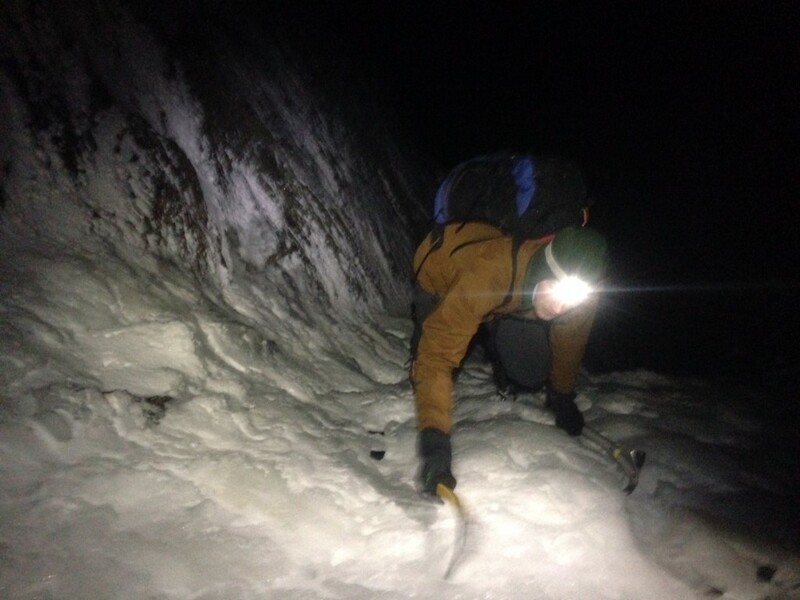 I’ve probably gotten about 20 days of ice climbing in the past two seasons; the rest is made up of headlamp soloing, Nordic skiing, and dry tooling on our little home wall after work. In the fall of 2016, I tore my right shoulder’s labrum on a sport climb in Canada. I knew, right away, I’d done something bad, but I thought I could climb through the injury. I wanted to have fun with my friends. I figured I’d be able to get out a little with the little cadre of smack-talking north Conway-ites I’d come to call my regular climbing partners. If Bayard Russell’s a little blip on the social media radar these days, Ryan “Rhino” Driscoll flies under it entirely. I don’t think the guy’s ever, ever posted about his climbs. 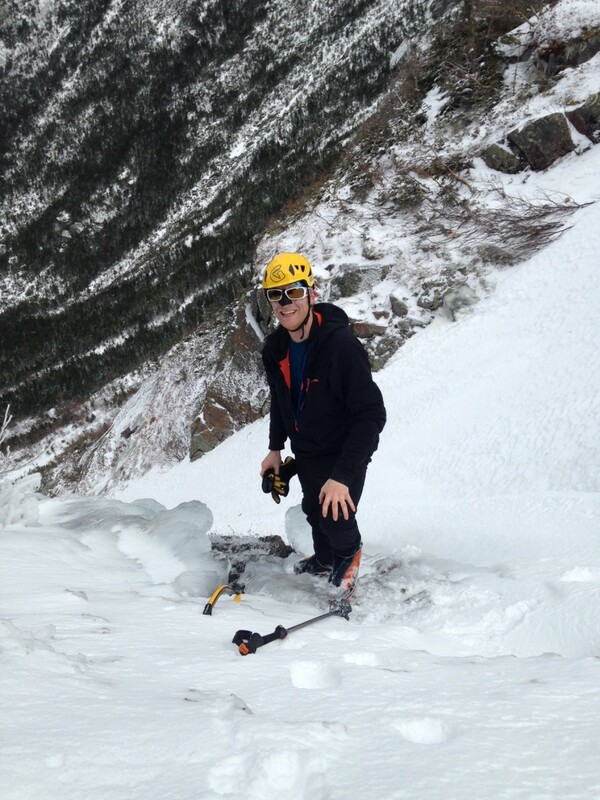 Pound for pound, Ryan’s one of the most promising young alpinists in New England. But he still climbs in fleece gloves, he wears black and brown, he’s got a Johnny Waterman-style penchant for substances, and he thinks it’s pretty shameful to post a single photo on Facebook. He hangs out with his dog. The first time I climbed with him, we scratched our way up something in Huntington Ravine. “That was the best climb I’ve ever done!,” Ryan chirped. Of course, every climb I’ve done with Ryan since, he’s said the same thing. I quickly realized his steady temperament and tree-trunk legs were the perfect antidote to my twitchy, skinny personality in the mountains. 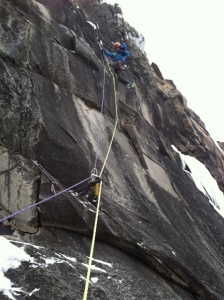 We worked our way up a few routes in the Canadian Rockies last season. He’s got the head and the endurance for longer climbs, lumbering uphill like a truck in low gear. 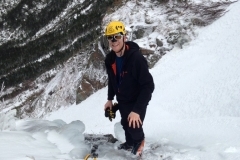 He and Justin Guarino were hit by a falling snow mushroom on Mount Bradley in Alaska last year, sending them careening 200 meters down the route’s easy upper snow slopes. 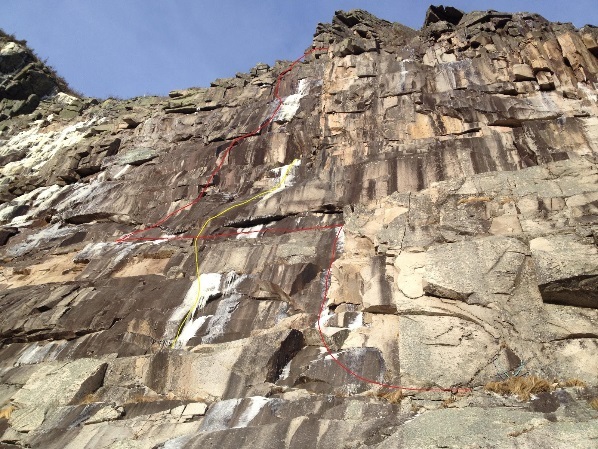 A rope snagging on a rock band saved their lives. Ryan got up, shook off his smashed Sirocco helmet, made sure Justin was OK, and they kept climbing, too far up the mountain to retreat. Sponsors should throw him gear but they don’t, choosing instead to go for twitter-happy Instagrammers with half his ability. “It never happened unless it’s on social media,” we joke, then Ryan goes back to texting his fiancée Angela on his flip phone, wondering about Rupert the dog. Before my shoulder surgery, I eked out a few climbing days last winter, and the most fun one was the first. 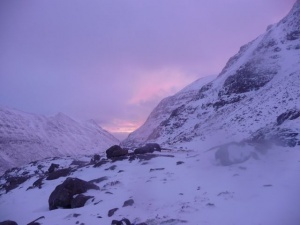 Bayard, Ryan, and I trudged up the talus into Huntington Ravine, where there’s some unglamorous mixed climbing to be had, especially when it’s Scottish outside, which it certainly was: freezing cold and blowing us over as we stood racking up. 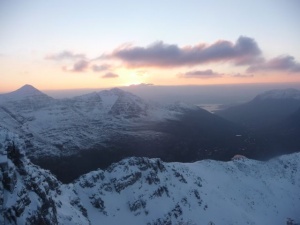 We’ve always adhered to Nick Bullock’s rules up there: no snow, no go. 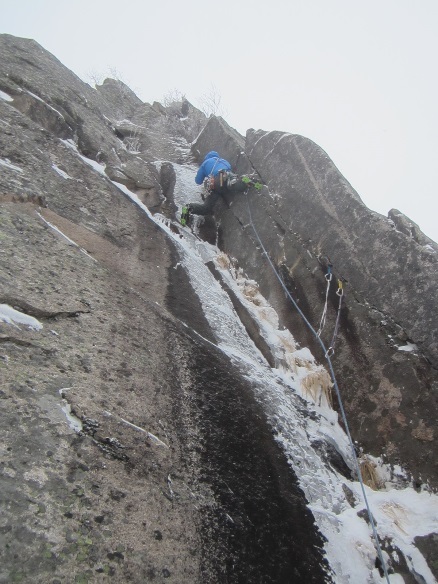 There wasn’t much of a question as to who would lead the crux pitch, and we loaded up Bayard, our senior-most member, up with pitons, a hammer, slings, and hexes and pointed the ringer in the direction of the cliff. He prodded his way up around the crux corner of a route Ryan had checked out the year before; an old, obscure rock climb called Misty. He banged in a piton and launched. 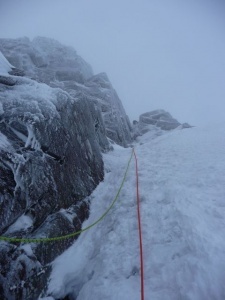 I was hardly paying any attention to the ropes: Bayard would send the pitch and then we’d do the route’s first winter ascent. Just like always! But his tool popped and off he went, a shower of spindrift and ironmongery. The old double ropes stretched, but the piton held, and Bayard lowered off, still in high spirits. 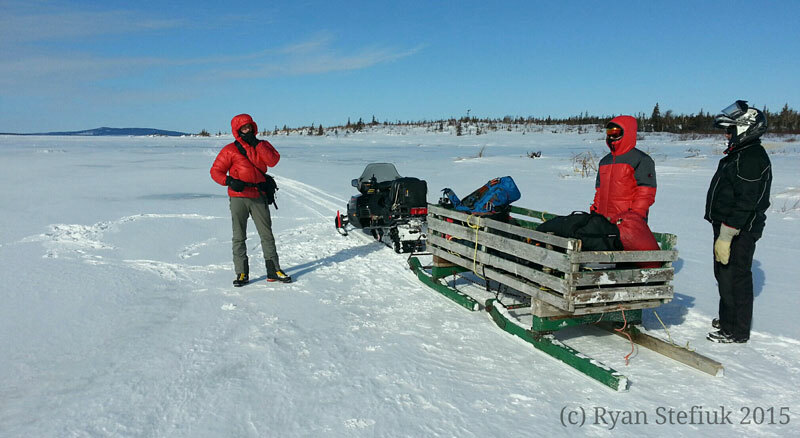 If Bayard fell, it meant the route was hard. I guessed I was, and racked up, scared shitless. I scratched my way up to Bayard’s high point, banged in another piece of gear, and found the hook Bayard had popped off of. My right shoulder flexed. I was scared. I tried to weight the shoulder for a few seconds, unsure if it was the injury or my abilities in general that were holding me back. I lowered gingerly off the piton and we sent Ryan the Rhino up. I cursed myself for not hanging in there a little bit longer. Ryan Driscoll on the third pitch. It looks simple. It wasn’t. When Bayard’s on, he’s on. Unstoppable. But, like me, Bayard loves bailing, and when the psyche has been drained, he’s a pretty easy sell for swift retreats. The wind hammered us in the ravine. We took turns soloing the first bit of Cloudwalker to stay warm, belaying Ryan as he inched his way up the pitch. Bayard hadn’t brought any food, and we were running low on calories. Ryan couldn’t hear us through the wind, lost in his own terrifying world. “Michael.” I saw a twinkle in his eyes through several layers of down. It sounded so good. Ryan clipped our piton. He was about to launch up the crux. He was holding it together really well up there. I had. It was really good. Ryan had better fall off soon so we could get pizza and beer. I considered yanking on one of the double ropes. Ryan’s pretty thick-skinned. He’s had worse falls. 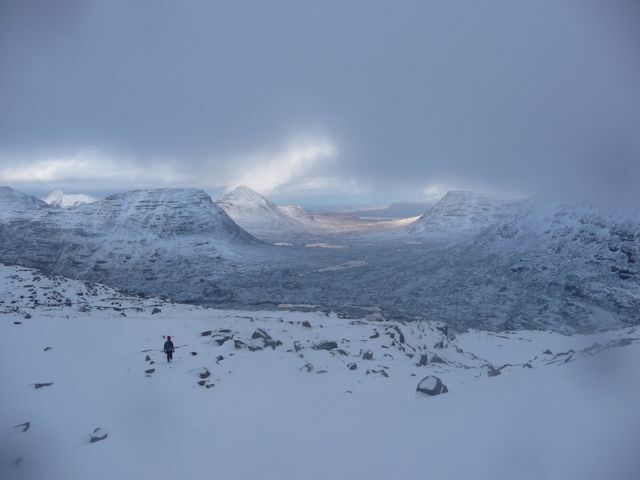 As luck would have it, poor Ryan had to take in the same spot I’d bailed, shaking his fleece gloves to re-warm his hands. Still, he kept going higher. 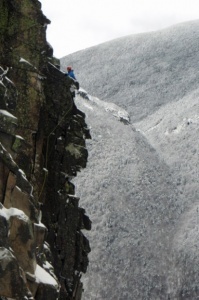 Past the 10-foot crux, the route became easier, but with little opportunity for good gear. 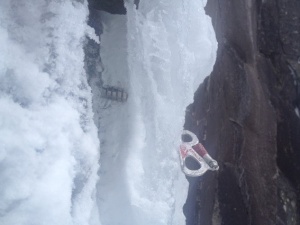 There was a terrifying fifteen feet where he was looking at a massive fall onto the piton. He finally crawled onto a ledge. “OFF BELAY,” yelled the Rhino. “WHAT! ?” The poor guy had just worked though the cold for an hour. 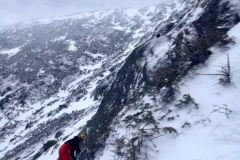 Now his friends wanted to leave him on New England’s deadliest mountain. 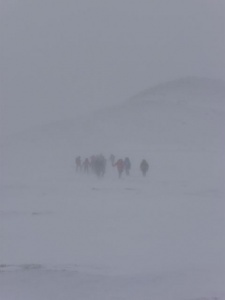 We sighed, cold, hungry and thirsty, and tied into the ropes. As we kept climbing, our hands warmed up, and Bayard became excited about climbing again. It was getting dark. “Wanna do another pitch?” We managed to clip half the rack onto Bayard’s harness before he charged ahead like a bull at a rodeo, furiously climbing a corner of neve and turf. 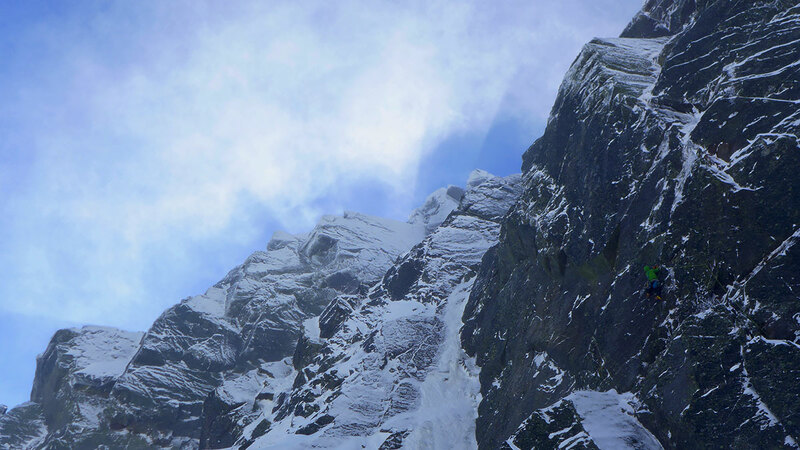 The pitch was classic alpine terrain, and we dangled from pitons, fifty feet from the top. 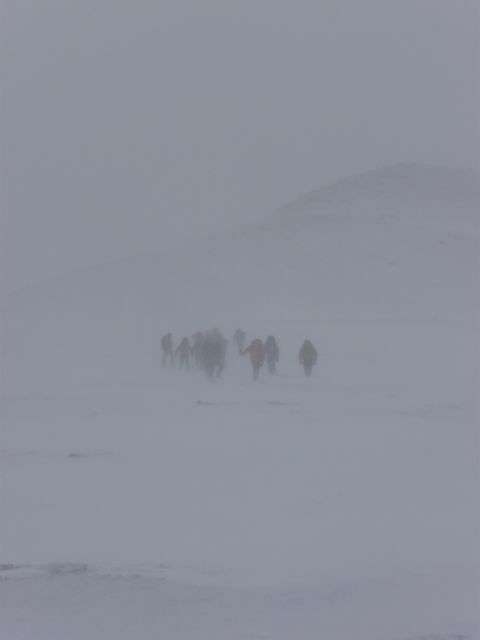 None of us had headlamps or puffy coats. It would be dark in twenty minutes or so. We rappelled, shoving our way through the crowded Shannon Door a few hours later. For some reason, I thought a lot about our obscure little route in the hot summer days after surgery. 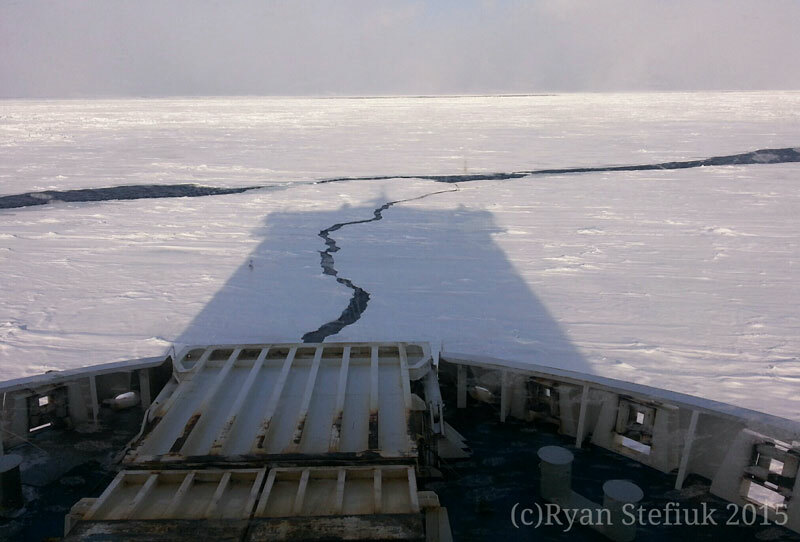 I’d bailed on my Alaska partner and went under the knife in April. (Clint ended up climbing one of the wildest routes in Alaska, the south ridge of Huntington, over a week with Jess Roskelley. I think I would have been too scared, anyway.) As the anesthesia pulsed through my veins, my surgeon pulled my arm out of the socket and flopped the useless joint around. “Oh man. This thing is loose.” I passed out. That summer I furiously pedaled our exercise bike, unable to leave the house. My shoulder sling sweated and itched. As July turned to August, I worked with my physical therapist to raise my arm above my head. I started trail running with the bulky sling on. The consequences were like soloing. A single slip would be catastrophic. 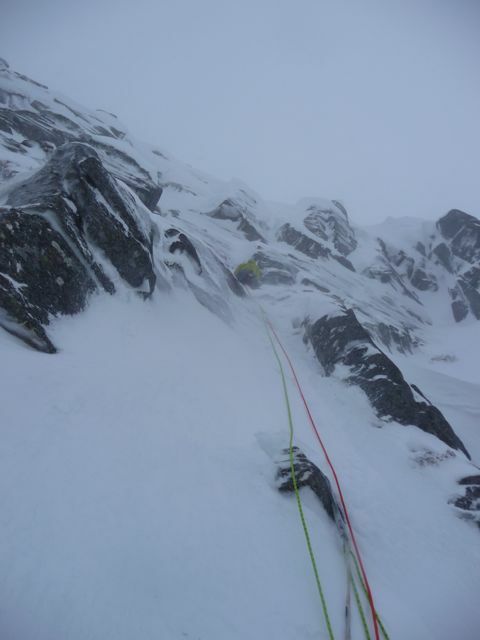 By the time November rolled around, I’d managed to lead a single 5.9 outside. I was weak and completely filled with self-doubt, afraid of the new anchors holding my labrum together. I’d taken a year off from climbing. “Wanna go up into Huntington ravine?” Ryan asked one day. I had the day off, and the weather was cold. I did, assuming Ryan would claim his lead and finish the route. Bayard was off in the Canadian Rockies with Raphael Slawinski and Nick Bullock. 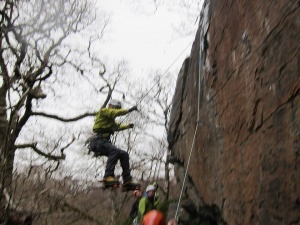 We figured he wouldn’t mind if we gave our piddly old rock route another go. 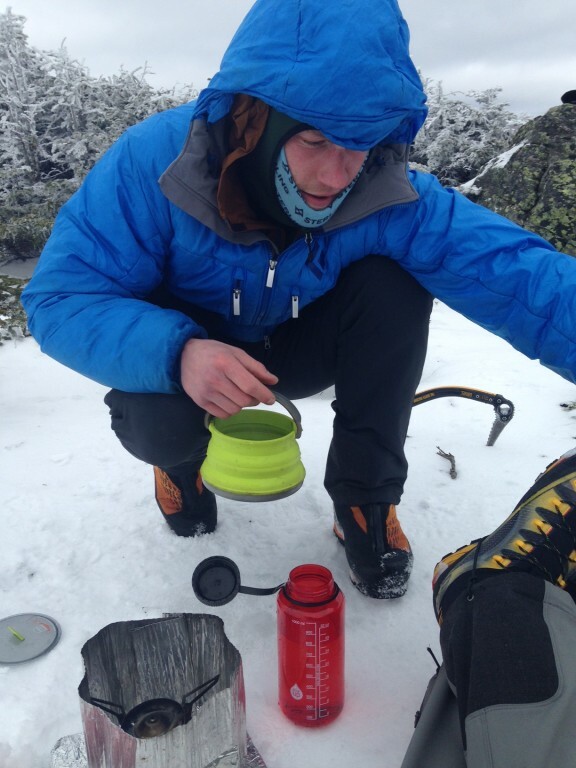 As we hiked up the trail, I remembered what it was like to carry a winter rack in my pack. I felt that old feeling rush towards me again, the wind up high carrying the cold air through the thinning spruce trees by the Harvard cabin. 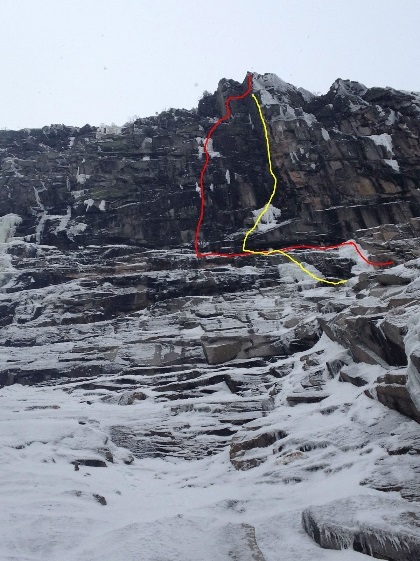 Huntington ravine is small and old school, but I’ve loved climbing there for 17 years, ever since my father dragged me up Yale Gully. 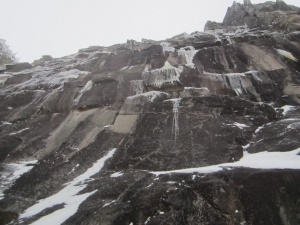 The Instagrammers were bludgeoning their way up ice climbs that had been put up when Calvin Coolidge was president. It was winter up here again. “Want to lead?” Ryan had pulled me up upper refuse, my first climb post-surgery this summer, something most of our friends wouldn’t stoop to climb without a paycheck. “I don’t care at all.” And he didn’t. He just wanted to climb with his friend. 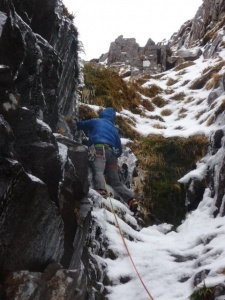 I wasn’t sure if leading an M7 pitch was a good re-introduction to winter, or to leading, for that matter. I tried not to think about it as I hemmed and hawed, hammering in pitons and retreating to rest on the big ledge below the crux. I was taking a long time. Finally, I forced myself around the corner. My feet cut for a second before I stood on the teeny edges, hammering in a little spectre hook. You’ve been thinking about climbing for a year. This is gonna be your only shot. All winter. Come on, youth. I cajoled myself. I committed to the right-handed hook. My tool held, and my new shoulder did, too. I pulled up. 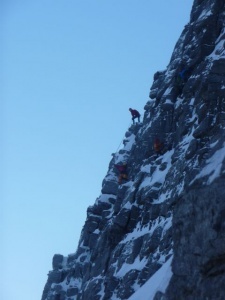 I crept past the bad placements, gingerly working my way towards the belay. I finally clipped in to my anchor, worked, and let out a whoop of contentment. I was climbing again! Ryan sped up the second pitch, and we hung on our old pitons, staring at that final fifty feet. What had looked like fifty easy feet of climbing in last year’s twilight before was anything but. 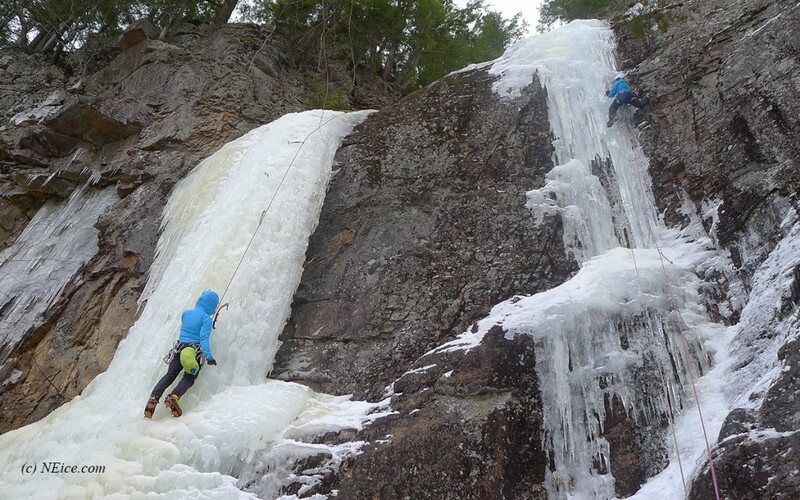 (Winter climbing rule number one: it’s always harder than it looks.) Ryan stated up. It was slabby and scary. 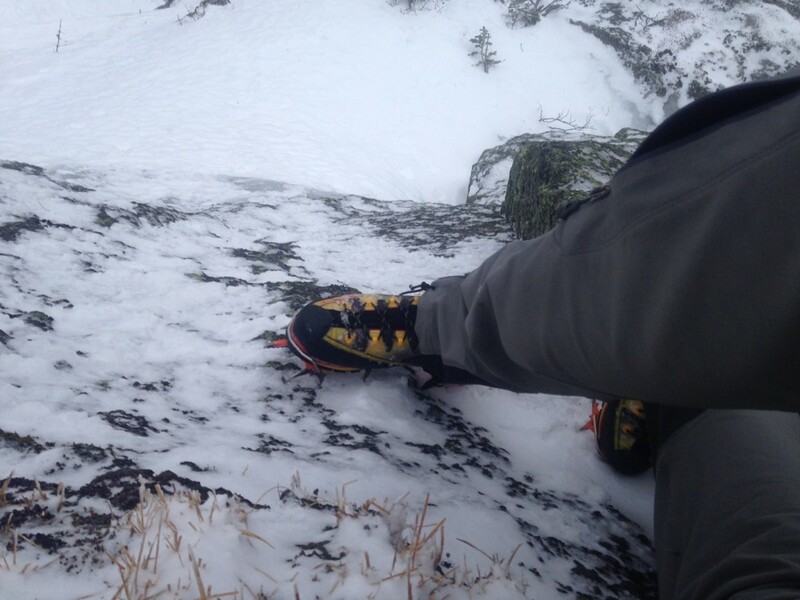 At one point, he committed to a turf blob above an overlap, heel hooking his crampon to pull his way up. Perhaps two or three of the six pieces he placed on the pitch might have held. I followed, worked, and fell, dangling on toprope in space. The pitch was steep. Finally, we were both on top. The shadows grew long in the sky. It would be dark soon again. I’d forgotten my headlamp again, too. We jogged down the trail to the car. 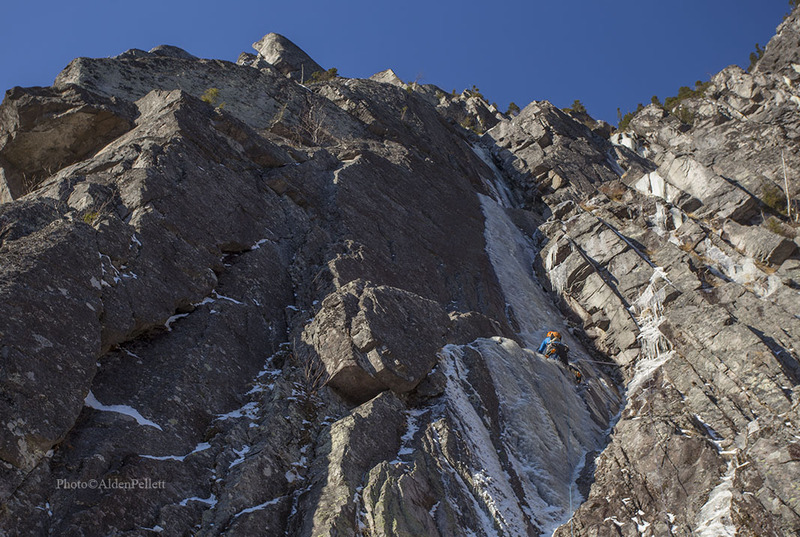 A few days later, Ryan and Bayard added a new route to what we’d dubbed the “Rhino Wall,” and I became inundated with work, sneaking out here and there for a few hours of winter fun. I guess when you don’t get to climb a lot, the days start to really matter, but who you get to spend them with matters even more. It’s been a great year for “Black Pudding Gully”. 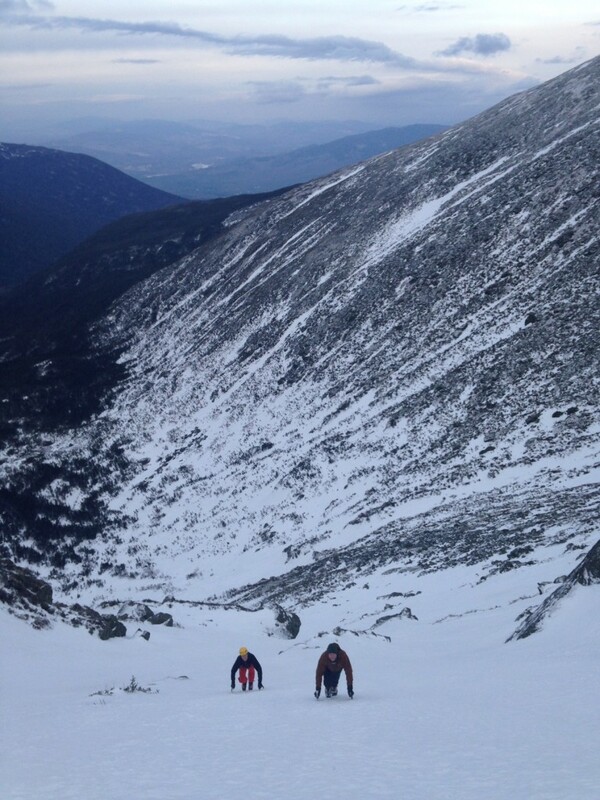 Hardly a gully, this climb can be steep and challenging at times, but it is fat and wide this year. And has seen a lot of traffic. 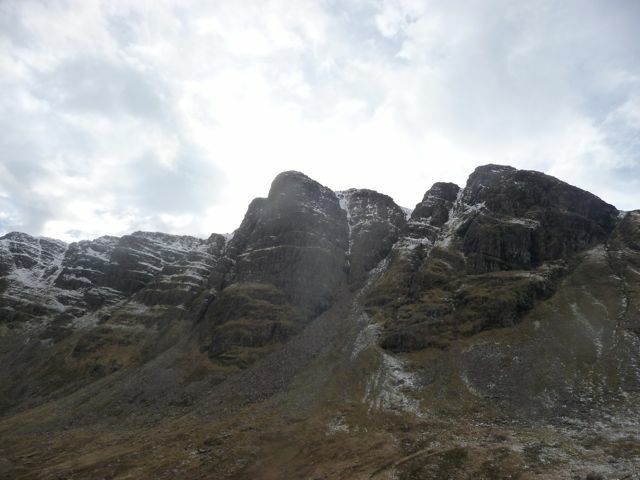 It has been many years since I have climbed it, so we figured we would go have a look. 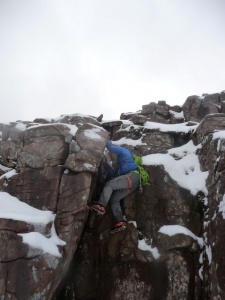 Surely by now it would be stepped and hooked out making for an easy solo. Just what we needed, a little physical and mental exercise for our midday break. 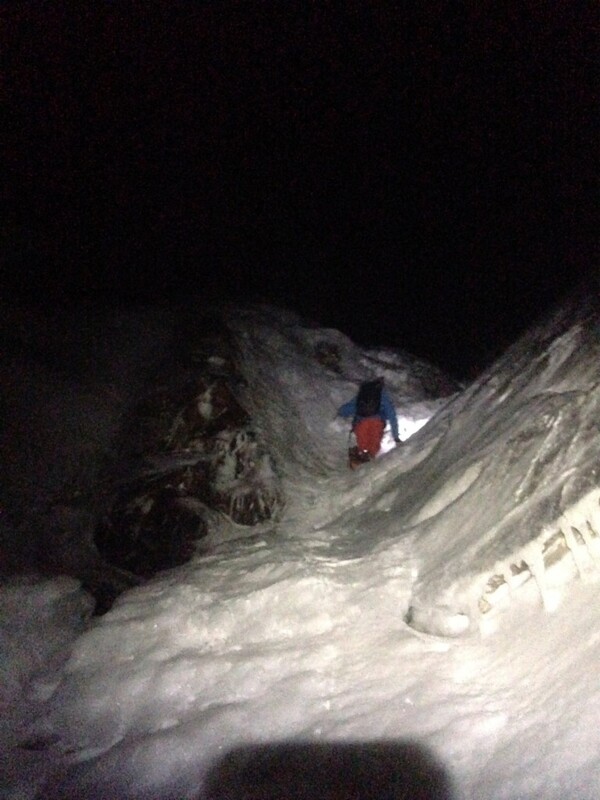 But we were late and two other parties of three were in front of us having fun climbing this classic line. So we took a line less traveled. 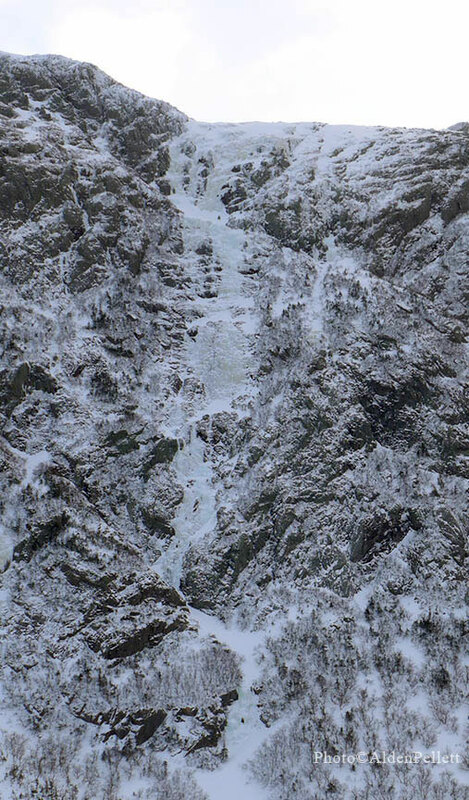 A nice ice flow just to the right. 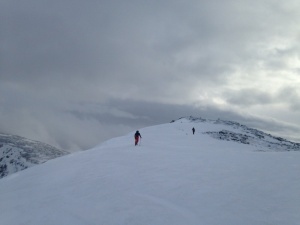 It was steep and candled but Alden took one look and said “If I can’t climb that, I should not be going to Newfoundland”. He walked right up it with grace and confidence. I followed, it was just what I was looking for. BAKP showed us she is ready for harder climbs making it to the top easily with only a few squeaks ;-). Off I went to heat up the soup. Fred followed the climb and then, the Black Pudding Gully was standing alone, ready for Alden to climb before heading back for his Ice Fest responsibilities. Me climbing Black Pudding Gully in the 80’s…Note the lack of a helmet, and the straight shaft tools you can’t see. I slung the column then put in two airated screws, and then headed to the top for good gear. I love this event!!! So good to see everyone. It’s like a big family reunion! My only regret is not enough time to do all I wanted to do, or enough time to spend with everyone I wanted to see. I can’t wait till next year. 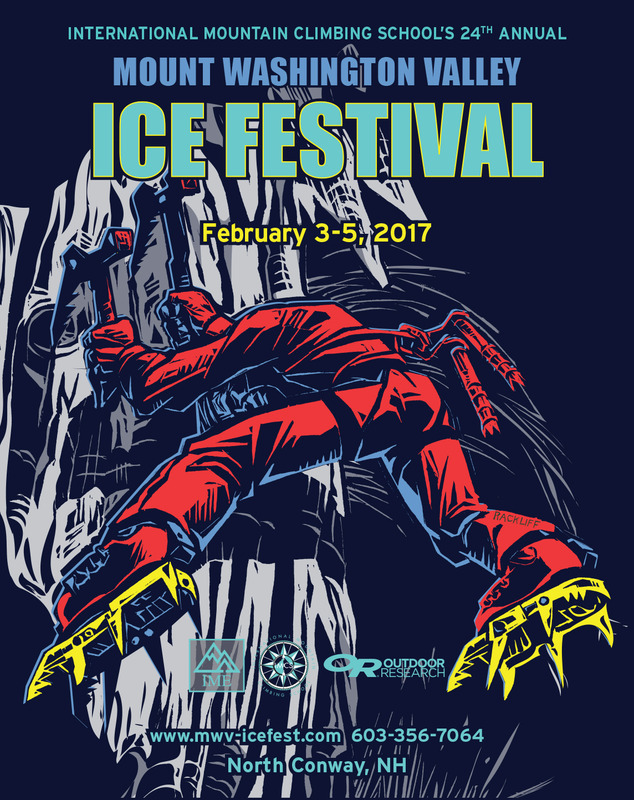 Many thanks to the MWV Ice Fest crew for all the hard work they do to put this event together. Thanks to all the sponsors that make this event possible. And to the guides for sharing their expertise of this amazing sport. And IME and Theater In The Woods for hosting, and to IMCS for coordinating all the guides. And thanks to all of you that attended, to make this the biggest, and best Ice Fest in the North East! 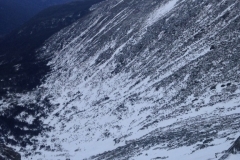 Solo had a great time at the 20th ADK Mountainfest and captured some spectacular images. His first trip to the Adirondacks and he can’t wait to return. Many thanks to The Mountaineer and Rock and River for all the hospitality. From the exposed ledges of the Whitney Gilman Ridge it would call to me. I’d snap seemingly random photographs and stare distractedly. I’d remind myself that as a guide I should remain focused. The giant corner system above the Cannonade Buttress is exposed and looms over the talus like an inverted cargo train. The steep face below is split by a series of cracks and seams that I visually kept following back to the base of this massive corner. 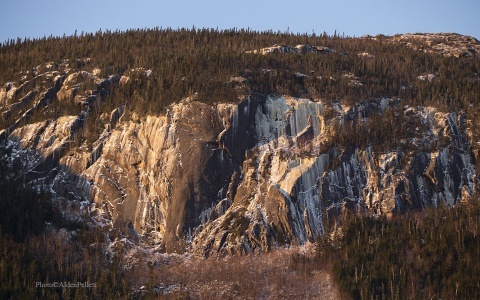 In the winter, I’d rack up and wonder about the imposing prow which starts as a large corner, briefly evaporates mid cliff, and reasserts itself in steep prominence like a wave threatening to break on the talus beach. Despite having made five attempts on this route with various partners, I knew that I could put it to rest this time. 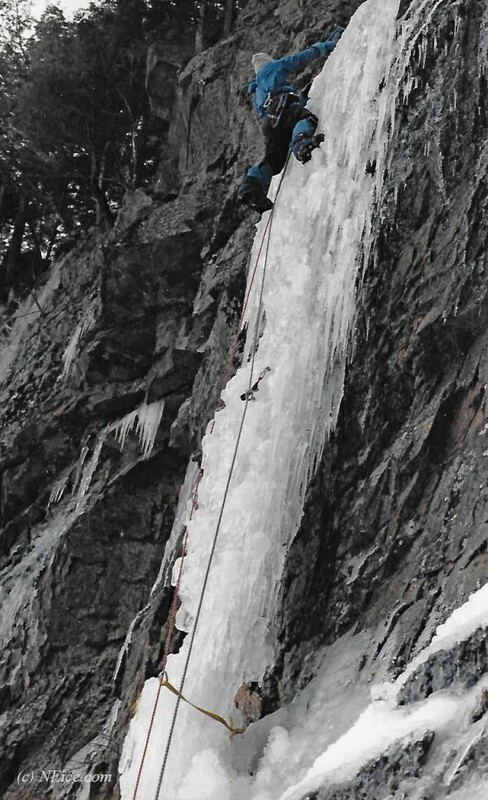 The source of this confidence being an extra five feet of ice not present during my last lean condition attempt. 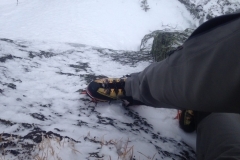 This ice made me think I wouldn’t need to place gear in the seemingly unprotectable terrain above my highpoint. I have climbed on this route with some of the greatest members of our climbing community. Today was no exception, Jim Shimberg owner of Rhino Guides kept telling me I was “grilled” as we made upward progression. 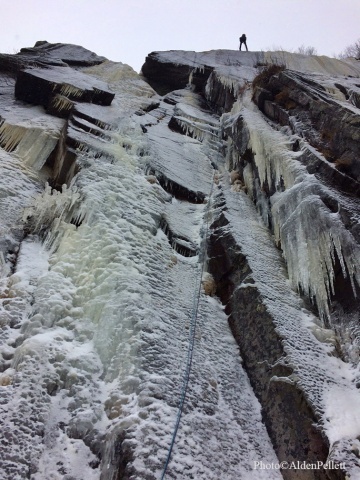 The icy cracks of the first pitch felt heavenly and went quickly. 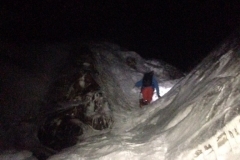 Snow conditions were perfect which made the technical pitch two traverse a sidewalk. Pitch three is where the business begins. Off the piton anchor, I clip a nest of gear and situate myself at the first crux where a splendid vertical slab becomes slightly overhanging. 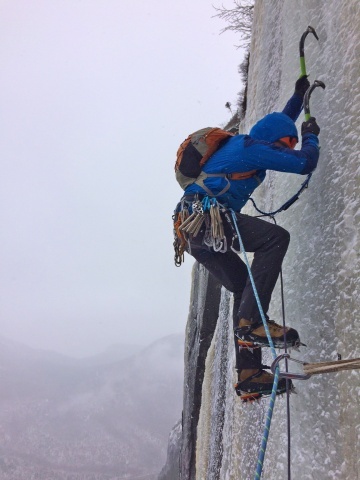 With both tools over my shoulder, I side pull crimp an edge, step my front points high onto nothing, and at full extension I virtually kiss my ice tool ‘goodbye’ to wrangle a solid matchable edge. Committed, a fall from here would land me below the belayer in a big swinging arc. Better not to fall. A couple solid tool placements and strenuous lock offs allows me to clip a great piton and bust some layback moves on a flake to gain a rest beneath a small roof. 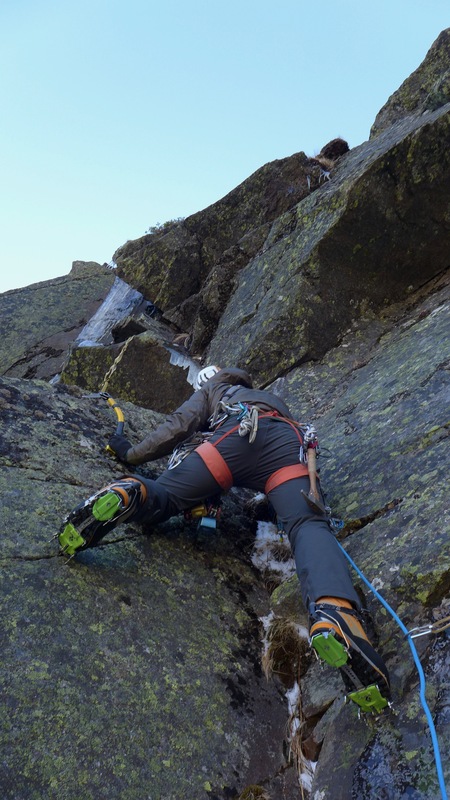 Reaching out over my left shoulder, I pull through the roof and high step into the next crux which feels like muckling a greased refrigerator with an iced up rattly hand crack on the left and an equally slick rattly finger crack on the right. Surmounting this block feels monumental. After some steep cranking, I gain a good stemming rest and a short flaring corner that becomes an in-cut, kinda sidepull rail with good hooks and some tiny gear. Stellar, exposed climbing gains a tiny ledge which, with a micro wire, and a tiny fixed pecker a body length beneath my feet, provided much spice to mantle. 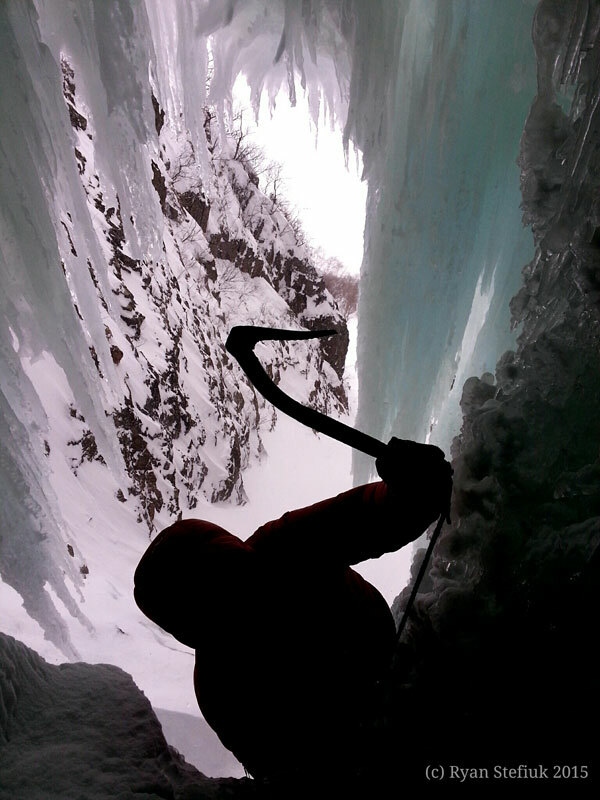 Placing a great piton awkwardly at my knees, I was just a few moves from mantling onto the icy sloping ledge above. I’ve always said I was gonna kiss this ledge when I got there. Tough to describe the exuberance I felt from finally reaching this point. The rest of the pitch isn’t easy but comparatively its a walk in the park. I knew it was in the bag. Michael Wejchert, and I met at Cannon Cliff the next day. 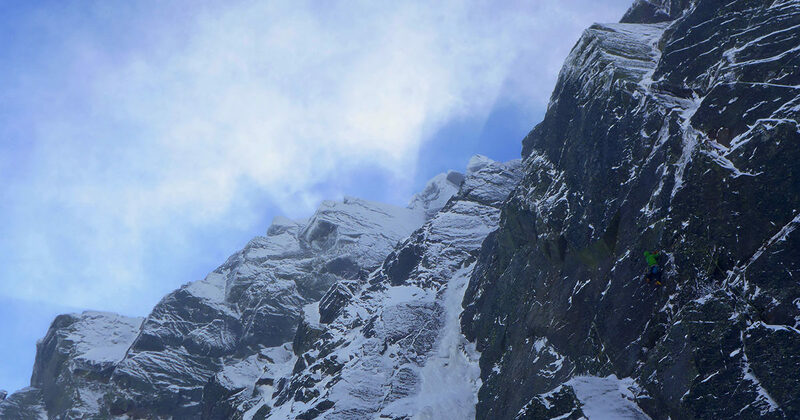 I wanted to climb a variation to Cannonade Direct that would allow me to climb the entirety of the monstrous upper corner. Being a little sore from the previous three days of strenuous climbing, I slurped multiple infusions of Mate and blasted Rage Against the Machine. Another warm day. At the base of Cannonade Direct I racked up. 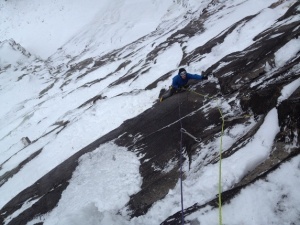 Having climbed this amazing pitch five times, I have it rather dialed. 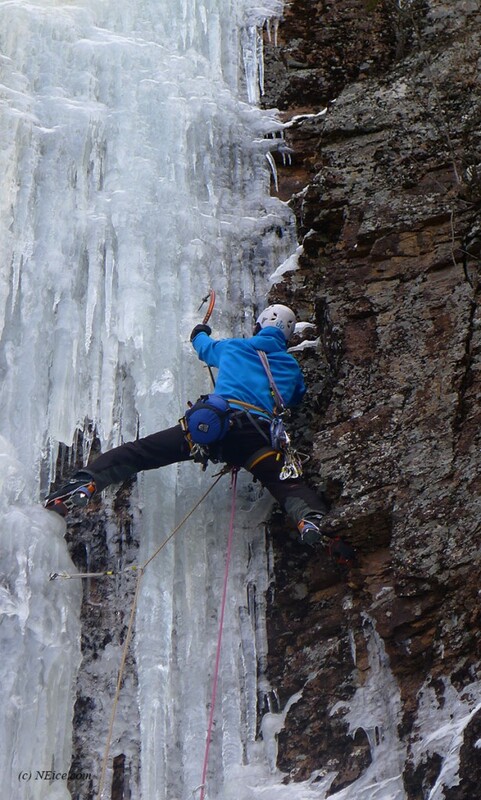 I torqued iced up cracks, stemmed familiarly, and sloppily sped up the 65 meter pitch. Now for the variation! I situated myself under the first crux and placed a couple bomber knifeblades. A right arching seam catered minuscule technical edges and tenuous high steps. 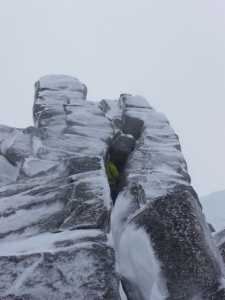 The rock is bomber but I enjoyed a handful of whippers due to exploding micro flakes. Making these technical face moves earned me some awe-inspiring hooks and the most elegant horizontal finger crack which welcomed the necessary gear and an adequate rest before the next crux of gaining the ice. I know I’ve got one shot. The holidays are upon us. The rain is upon us. My early season project’s ice will not form again. I lower to the ledge and fire the crux, pull gingerly onto the steep ice and build a belay at the base of the mythical corner. 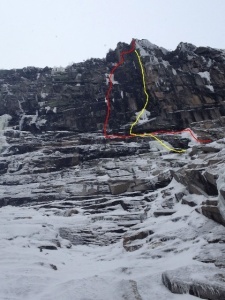 Cannonade Direct (red) and second to last pitch of Cannonade Direct Direct (yellow) in much leaner conditions.